Proposition 63 is a California ballot proposition that passed on the November 8, 2016 ballot. 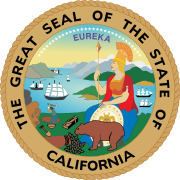 It requires a background check and California Department of Justice authorization to purchase ammunition, prohibits possession of large–capacity ammunition magazines, establishes procedures for enforcing laws prohibiting firearm possession by specified persons, and requires California Department of Justice's participation in the federal National Instant Criminal Background Check System. Supporters of the measure stated that it would “fix a major flaw” put in place by the passing of Proposition 47 in 2014 by stating that theft of a firearm is a felony, regardless of its monetary value. A September 2016 poll from USC Dornsife / Los Angeles Times showed 64% percent of registered voters in favor of Proposition 63, 28% opposed, and 8% unknown. A November 2016 poll from Insights West showed 57% percent of likely voters in favor of Proposition 63, 35% opposed, and 8% undecided. ^ "Statement of Vote - November 8, 2016, General Election". December 16, 2016. Retrieved January 7, 2017. ^ "Proposition 63. California General Election November 8, 2016. Official Voter Information Guide". California Secretary of State. Retrieved 10 October 2016. ^ "A California gun measure that's too high-stakes to fail". sacbee. Retrieved 2016-10-11. ^ "USC-Dornsife/LA Times Poll". USC Dornsife September 2016 Poll. September 2016. Retrieved 11 October 2016. ^ "Clinton is Ahead of Trump as U.S. Presidential Election Approaches". Insights West. November 2016. Retrieved 8 November 2016. ^ McGreevy, Patrick (November 8, 2016). "California voters approve gun control measure Proposition 63". Los Angeles Times. Retrieved December 7, 2016. This page was last edited on 23 April 2019, at 03:33 (UTC).